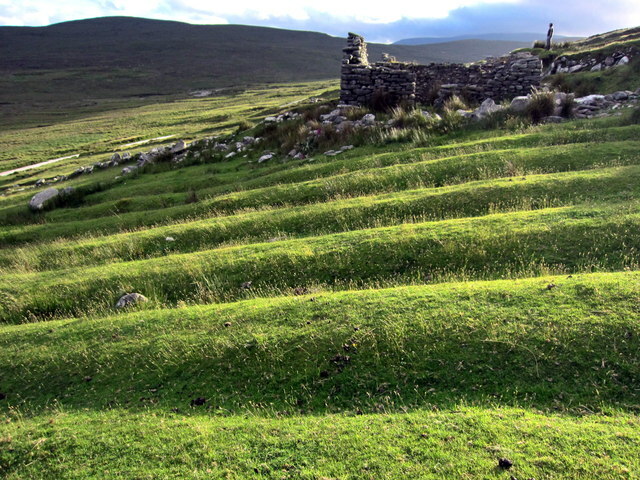 The Deserted Village is located on the southern slopes of Slievemore,straddling the 200 foot contour and stretching from west to east for about 1.5km. The village comprises 3 settlements, linked by an ancient pathway. 84 houses remain out of 137 which were recorded on the first edition Ordnance Survey of 1838. Almost all are aligned north-south, parallel to each other. They are single chambered, two-chambered or a single chamber with an outhouse or stable attached. Most of the houses at Slievemore are one-roomed cabins, called 'byre-houses' because of the practice of keeping livestock indoors during winter. There is an extensive system of lazybeds. © Copyright Pamela Norrington and licensed for reuse under this Creative Commons Licence. This page has been viewed about 220 times.